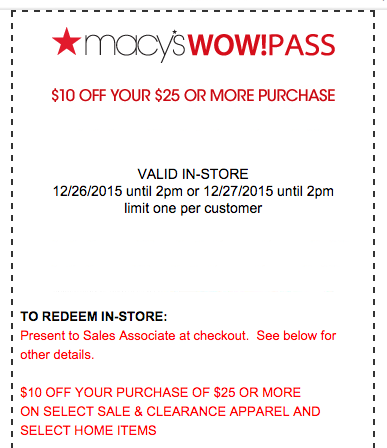 Macy's: Early Bird Sale (Until 2PM) 12/26 & 12/27! You are here: Home / Great Deals / Early Bird Sale (Until 2PM) 12/26 & 12/27! Early Bird Sale (Until 2PM) 12/26 & 12/27! Today & Tomorrow, Macy’s.com has a fantastic deal on select sale & clearance apparel & select home items! Score $10 off a $25 purchase when you use promo code ODS25 at checkout! Plus, be sure to choose FREE in-store pick up (if available at a Macy’s location near you). Otherwise, shipping is FREE on orders of $25 or more!